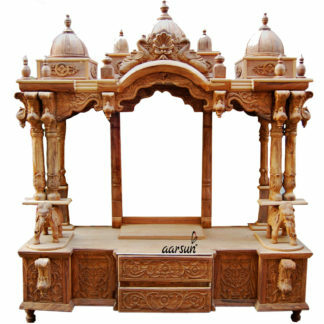 Aarsun woods presents you this hand crafted wooden mandir best suitable for home or office purpose. There are beautiful domes at the top along with beautifully carved mehraab at the front of the domes. Below the mehraab there is a base along with two beautifully carved piers at the front. The front top consists of Two adjacent elepahnts with garlands in welcoming position. The base is made up of teak ply wood. Just below the base there are 3 drawers and cabinets with shelves for miscalleneous things like incense sticks, camphor,lampoil,rosewater,etc. especially made for holy books,or other acessories related to diety and all other pooja essentials. The puja mandir is supported by round shape feet on all four corners. 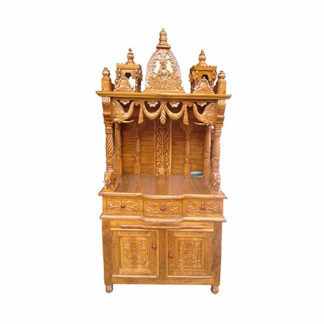 Teakwood is the deciduous tree which is used from the centuries for making wooden furniture’s. Teakwood has its own natural oil which helps it to be termite and pest free. Teakwood is one of the most durable woods even when it is not treated with oil or varnish. We always use the old timber in making our products because the timber from old trees is more durable and harder in comparison to plantation grown trees. Teakwood is mostly used in making outdoor furniture’s and boat decks. Over the time Teakwood can change its colour into silvery grey finish when exposed into sunlight.